Many kids look up to their dads. But rarer is the father who looks up to his kids. That describes the relationship between Josh Argall and his son, Devin. When Josh speaks about Devin, you can hear respect, love and pride shining through his words. Hailing from Wisconsin, Josh is a loyally dedicated father of three and passionate advocate for all families in the MDA community. His dedication to raising awareness for MDA stems from his deep love for Devin. 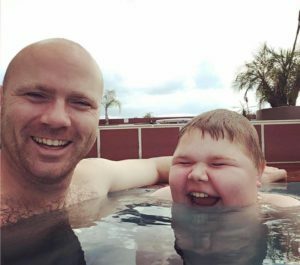 “I love him with every ounce of my being,” he says, and it is from this love that Josh’s advocacy journey began. Josh and Devin are quite the pair. Together they have raised more than $45,000 for MDA and show no signs of slowing down. Devin was diagnosed with Duchenne muscular dystrophy (DMD), a progressive and fatal muscle-debilitating disease, at age 3. Josh, who had separated from Devin’s mother, Dawn Kaufmann (also a big supporter of MDA), was a single father at the time. Hearing the diagnosis left him “so shook up everything seemed as if were not real.” But as a single parent, Josh resolved to stay strong and keep positive for Devin’s well-being. They encountered MDA early in their journey. When Devin was first diagnosed, Josh says that MDA was there at the Children’s Hospital in Milwaukee to offer support. 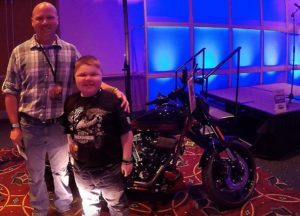 As he got to know MDA, Josh quickly realized how important it was to have a community around, especially as a family with a child newly diagnosed with a neuromuscular disease. Meeting and forming relationships with other families is “extremely beneficial,” Josh explains, because it gives parents the chance to learn from others who have been through the experience. Josh was so moved by his “experience of love” from MDA, he committed to helping out in whatever ways he could. 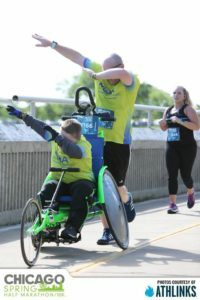 Like father, like son: synchronized dabbing on the course of the Chicago Spring Half Marathon in May 2017. Josh describes Devin as “absolutely incredible, so loving, and quick to make people smile.” He says Devin is an adventurer and loves riding his ATV, but those hobbies come after his commitment to MDA and Team Momentum, MDA’s long distance running program of which Devin and Josh have been longtime teammates. 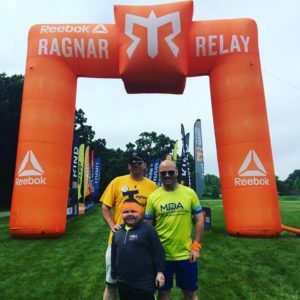 Team Momentum plays a huge role in the Argalls’ lives today, but Josh’s initial decision to run a marathon to support MDA started mostly on a whim. When Team Momentum first launched in 2013, Josh said he received an email that offered entries into the Chicago Marathon and signed up within fifteen minutes of reading the email. It was, as he says, his “call to action.” Given how many miles he’s logged since that fateful email, it’s almost impossible to believe that he wasn’t even a fan of running at the time. But the purpose and mission of the team have driven and encouraged him to this day. Josh says he will never not be a part of Team Momentum because, for as much as he has given, it has given back so much to him as well, like better health and meeting families he has grown to love. “I wish everyone would give it a shot,” he says. “The hardest thing about it is filling out the form and committing to the team.” Josh would know: he was the first official member of Team Momentum. He is proud of the claim. “I was there from the beginning and I will be there until the end,” he says. Running together is an important bond Josh shares with Devin. “I pretty much don’t sign up for a race unless Devin can sign up as well,” he says. The exception: the Chicago Marathon. This year, Devin will still be a month shy of his 16th birthday, the cutoff age to participate in the race, but Josh says as soon as he is old enough, they will be running the Chicago Marathon together. Until then, Devin will continue to cheer his dad on. Devin’s odds-defying health can be attributed partially to a medicine called Exondys 51, which he received as a participant in the drug’s clinical trial phase. Now approved by the FDA, it is the first disease-modifying drug for DMD available for boys like Devin. Josh with Genevieve, Benny and Devin at the Green Bay Muscle Walk. 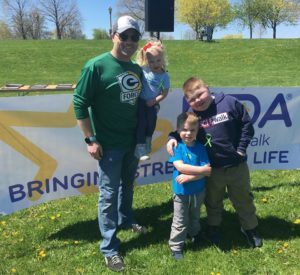 As the Wisconsin State Ambassador, Devin is involved with all things MDA: Shamrocks, Fill the Boot, Muscle Team events and everything in between. Here, Josh and Devin represent at the Harley-Davidson Black-N-Blue Ball in Milwaukee. Josh credits the MDA for being “our greatest support” and says it has helped him become the person he is, as a father and man, today. He is grateful for the recognition he’s received but says he doesn’t do anything beyond what flows naturally from the fierce love he has for his son. Josh and Devin are fundraising for their 2018 races. Help them cross the finish line!